The BBC America sci-fi hit Orphan Black wins the 4th May Madness Award. 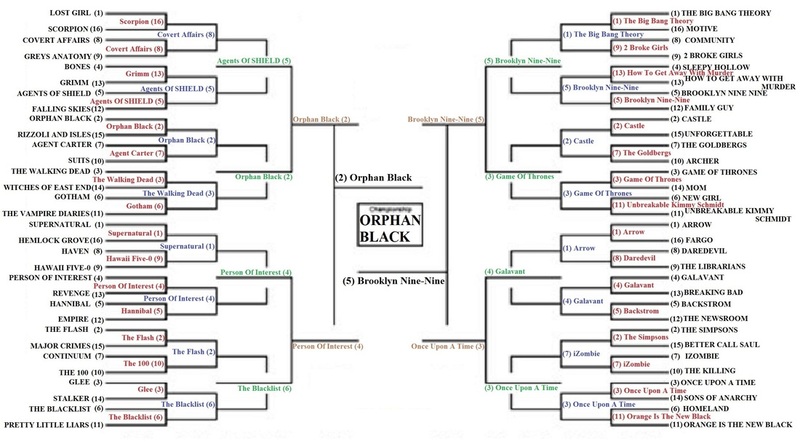 A Sweet 16 finalist last year, Orphan Black managed to defeat all comers this year, including the show that garnered the Favorite TV Character winner, Person of Interest. The 2nd honour for the show here, to go along with their 2013 Best Of TV Awards Win for Best New Program. In a year of notable upsets, Brooklyn Nine-Nine, a show that only finished 7th in the Best Comedy category this year, managed to become the Runner ups this year. SAMANTHA GROVES/ ROOT (Amy Acker) "Person of Interest"
With a finals consisting of 2 contenders that were mostly "out of nowhere" for May Madness standards. Samantha Groves, better known to fans of the show as Root (portrayed by Amy Acker) from "Person of Interest" wins this years May Madness Favorite TV Character tournament. Her win came at the cost of having to defeat 3 other characters from her own show. Her only prior May Madness effort saw her lose in round 2 last year. Runner Up was Auggie Anderson (portrayed by Christopher Gorham) from "Covert Affairs", winner of the 2014 BOTVA Best Actor in an Action/Drama Program, made a strong run to the finals before falling. His only prior May Madness effort saw him lose in round 2 in 2012.